Founded by famous movie star and Kung Fu legend, Jackie Chan, in October 2006, the Contemporary Dragon Kung Fu Company consists of some of the most talented young martial artists from across China. Hand-selected by Jackie Chan himself, the artists were all under the age of 18 when the group was formed (with the youngest being only 11), and came from some of the country’s most prestigious martial arts groups including the Shaolin Kungfu Monk Corps and Chinese Shenwu Cultural Communication Company. In such way the Theater was created. The performance is able to surprise with its philosophical deepness and the offered synergy of the strength based in Kung Fu and the beauty of the contemporary dance. 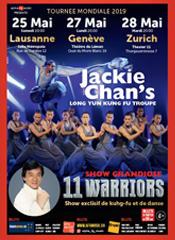 This is an extraordinary and vivid event, where martial art merges with traditional Chinese and modern dance. Kung Fu in Chinese means not to struggle but to achieve perfection, both physically and spiritually. Talking about ancient traditions and philosophies that demonstrate the greatness of the Chinese people. Over the course of centuries, the theory of the five elements (iron, wood, water, fire and earth) was refined in Shaolin Temple to give life to the "Five Forms": monkey, snake, tiger, praying mantis and crane.